KPY Shotshell Ballistics Version 2.0 is the latest version of the world's only comprehensive shotshell external ballistics program. As you can see from the screen shot above, it adds several very useful features: a full-fledged recoil program (where you can add the wad weight), most every shot material available on the market today from steel to 5 % antimony lead, nickel-plated lead, chilled lead, ITX E-13, to Nice Shot, etc. It will correct the 3 ft. muzzle velocity for you to actual muzzle velocity for you, it offers pellet count info, and you can add in your own elevation and crosswind. It will never go obsolete, for you can alway pop in your own custom shot material density. In the screen shot example, you'll see that Nice Shot #5 @ 1330 fps 3 foot velocity retains 1.5 inches of penetration to 47.4 yards, with 10.81 inches of 10 mph crosswind drift and 5.31 inches of drop. 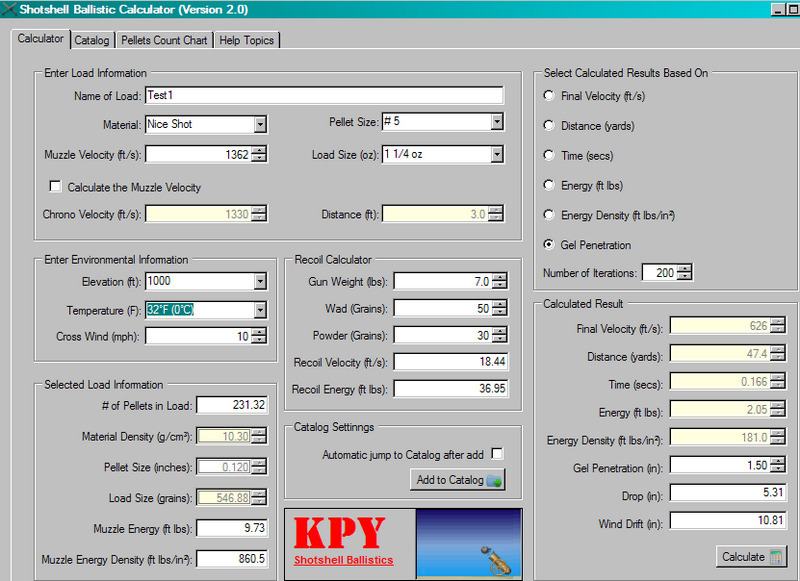 You can compare loads based on penetration, distance, time of flight, final velocity, energy, and so forth. After you've entered the parameters for a load, you add it to your "personal catalog" which you use to compare the loads directly, and naturally you can print out your own load list for future reference. You can save the info, and import it into your favorite spreadsheet program as you wish. It is a significant upgrade from the original, as far as I'm concerned, and there is no program out there that remotely offers as much exterior ballistics information for shotshells. Get yours today from: http://shotshellballistic.blogspot.com/ that also has more screen shots than I'm including here. It works on all versions of Windows including XP, Vista, 2000, and Windows 7.0.